This HVAC filter is anything but basic! Blocks most common household allergens, like pollen, dust, dander, and lint. 20x more efficient than standard fiberglass filters. 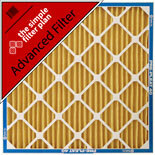 Our most popular air filter. Filters all common allergens, bacteria, smoke, smog, mold, virus carriers, and more. Traps allergens as small as 1.0 microns. Recommended for people with asthma or allergies. 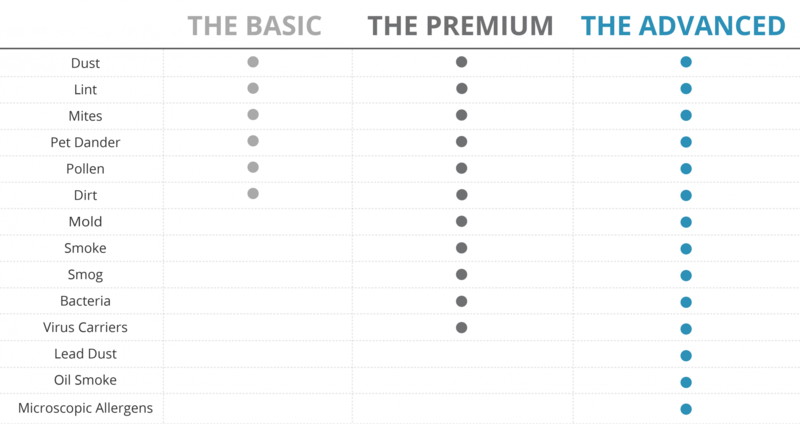 Use this chart to help decide what's right for your needs. Need Home Air Filter Replacement? You may not have paid much attention to your home filter system and the important functions it performs. However the air filter in your HVAC system is often something that is underestimated for the value that it offers. The air filter not only has a positive impact on your health and that of your family, it can also help to save you money. If you’re not sure about the many positive impacts of your home air filter read on. And also find out more about home air filter replacement. Breathe cleaner air. Dust, pollen and even some disease causing bacteria present in the air are filtered as the air is circulated within your HVAC system. Filter out the bad. As air passes through the filter, many of its harmful particulate matter are removed so that the air you breathe is cleaner and healthier. Ease allergies & asthma. If you or someone in your home has allergies or asthma, that is one more reason for you to be thinking of home air filter replacement. People with allergies and asthma are probably the ones that benefit most from clean, well maintained air filters. Keep your AC running smoothly .The AC has to work less hard and so your system will be less prone to seizing up or overheating. Avoid breakdowns. If your AC doesn’t have to work too hard to cool, it is less likely to breakdown. Protect it from dirt & pollutants. Dirt and pollutants are harmful in themselves; plus they cause buildup of moisture and growth of mold. Lower your energy bill. Your AC works more efficiently resulting in energy savings. Avoid expensive AC repairs. Efficient running means fewer chances of your heating and cooling systems breaking down. Pay less than you would for a store-bought filter. We also offer some of the best deals around (get your first filter free! ), helping you save more. Find out more about home air filter replacement. Click BUY NOW or call us at 866-333-8473 today to learn how often you should be changing them based on your usage! 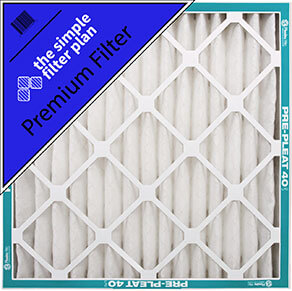 All of our filters are made in the USA by the largest filter manufacturer in the nation, Flanders Corporation. They are the same, quality filters used in hospitals, and even by NASA. All the air in your home passes through a filter, usually twice a day. The filter’s job is to remove any harmful particles and clean the air. A clean filter means less work for your HVAC system and healthier air for you. Not only can you have a filter delivered to your door for less than it would cost to buy at the store, but you will also save 5-10% on your energy bills each month with regular filter replacement (EPA). Actually, with Simple Filter Plan, you don’t even have to think about changing your filter at all! Sign up for our air filter subscription service, and cross the hassle of buying a new filter off your to-do list for the rest of forever.